"Elizabeth is professional, confidential, nonjudgmental, and extremely fun to work with! She has helped me take the chaos out of my life and replaced it with confidence, control, and peace of mind which are priceless." "I felt completely overwhelmed until I read 'Organize with Confidence' which helped me to increase my productivity, which then decreased my frustrations and increased my inspiration; therefore, my transformation! When I am transformed all those in contact with me can also be transformed and reap the benefits. Elizabeth's knowledge, expertise, and encouragement are a Godsend." "Before setting up your Command Center system, I had this enormous pile of paper. Anything I would print out would go into this pile. And whenever I needed to find anything, I would have to dig through the pile. That meant a lot of lost time, some headaches, and even a few paper cuts. Ouch! Then I discovered your Command Center. WOW! What a difference. I love being able to know exactly where to find any given piece of paper I have in an instant. Who knew it could be this easy! Thanks for this awesome idea! As a busy entrepreneur, your Command Center has been priceless!" 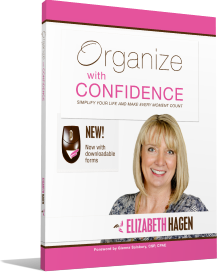 Order the Organize with Confidence manual TODAY and begin transforming your home, your workplace, and your life! Do you have a bunch of great organizing books by your bedside, in your bookcase, and on your coffee table? But, are they overwhelming to you with all their information? You are not alone! All my organizing clients have a lot of organizing books. That's one of the reasons I wrote my special manual!! My name is Elizabeth Hagen and I understand exactly where you are and what you are feeling! I am a mom of 5 and a business owner. Life used to get pretty crazy! But now, even though my life is very full, I feel calm and in control. And, that is a great way to feel! Find yourself comparing yourself to others? Find yourself being overwhelmed by all the clutter? Let your fears control you? Have a hard time thinking positive thoughts? Look at your life and wonder if this is all there is? Find yourself putting things here 'just for now' because you don't know what else to do? Wish you had a plan each day so you could feel like you got something important done by the end of the day? Face it; disorganization can be a disaster—both personally and professionally. Clutter complicates our lives and costs time, money, and self-esteem. But, taming the Big Bad Mess can be scary, overwhelming and disheartening—up 'til now! HAVE I GOT GREAT NEWS FOR YOU!!! In my Organize with Confidence manual I share proven tools to conquer clutter, organize like a pro, and reclaim your life. I teach you the tools I've developed over the past 25 years. Organize with Confidence comes with free downloadable versions of the workbook's forms to help you get started. Daily Checklist Form for to-do's, phone calls, errands, meal planning, etc. Manual owners, get your bonus forms and special gifts here!